Massage has always been an important feature of Indian family life. It is a treatment that has evolved from traditional techniques that have been practised in India as part of a family ritual for over a thousand years. ​It takes the form of a forty minute non-invasive upper back, shoulder, neck, head and facial massage which can be given clothed (vest or strappy tshirt advised) and seated in a chair. "I have found that this is an ideal way to clear away all those worries and stresses that can accumulate when working. I lead a busy life working in a primary school, two teenage children of my own and find that taking time out to visit Jean the perfect way to put everything back in order. I find that as soon as Jean greets you at the door, you feel peaceful . I didn't know what to expect from a head massage, but it all begins with a back massage. The sensations that I feel, range from light tingling from my upper body and I am always amazed at how warm I feel at the end. 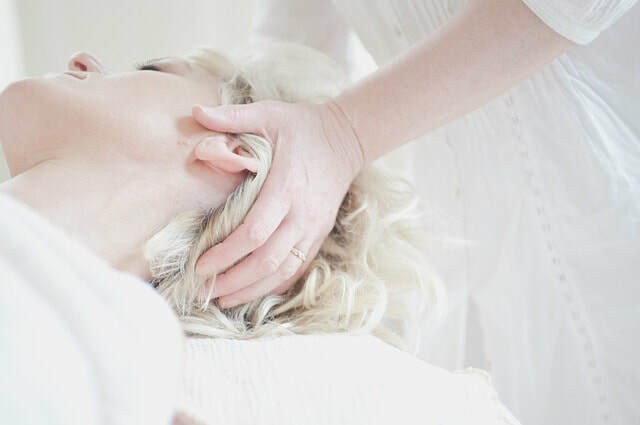 I can thoroughly recommend the Indian Head Massage and Jean Carpenter as the perfect way to spoil yourself and set yourself up for the next hurdle!"